EuroSciCon is Europe’s largest and most significant scientific place which serves as a crossroad for the academicians and industry experts to build networks. With over 16 years of Life Science Communication, it focuses on to Spearheading the Transformation of Physics Research into Knowledge through Scientific Gatherings and Networking. The world’s leading Global Conferences organizer Euroscicon invites all the physicists from all over the world to attend the prestigious scientific "5th International Conference on Condensed Matter and Materials Physics" which is to be held during December 02-03, 2019 at Barcelona, Spain which includes prompt Keynote presentations, Oral talks, Poster presentations and Exhibitions from experts in the Condensed Matter Physics, leaders from the fields of Materials Physics, and students from diverse groups, leading universities, research institutions and Physics Industries to share their research experiences on all aspects of this rapidly expanding field and thereby, providing a showcase of the sophisticated techniques with theme - "Explore, Exchange & Experience the Unique Realm of Condensed Matter Physics". Our aim is to aggregate community and to create a platform for exchange of information on current technological developments, new scientific innovations and the effectiveness of various regulatory programs towards Condensed Matter Physics 2019. It provides a premier technical forum for expressing and knowledge about the advanced research and developments, as well as the l as exploration of new applications, technologies and to explore new trends in the fields of Condensed Matter and Materials Physics. Barcelona, the sophisticated and trendy capital of Catalunya, a city like no other in the whole world, a place where many different cultures mix and create a unique kaleidoscope of people, fashion, music, food, dances... A city which offers an architectural history that comprises from the 4th Century AD to the most impressive Modernist buildings; Barcelona is a home for artists and intellectuals, an inspiring town like few others. Sprawled between the beaches of the Mediterranean and the hills of Montjuïc, Barcelona is a city whose personality bursts at every natural seam. The capital of Catalonia, one of Spain’s 17 autonomous communities, Barcelona is also known as the country’s most progressive city, always on the cutting-edge of European art, fashion, and cuisine. The city is well known for its festivals, diverse architecture, nightlife, contemporary arts and a high quality of living. Aesthetically speaking, Barcelona is the most innovative and intriguing of all Spanish cities. Its beautifully preserved Gothic Quarter (Barri Gòtic) contains an impressive concentration of medieval buildings within the former confines of 4th-century Roman walls. This is the finest opportunity to interact with participants from the associations of Condensed Matter and Materials Physics, Solid State Physics, Materials Science and Engineering academicians. It mainly concerns on the modern impact and technologies in Materials Physics and other disciplines, as well as for initiation of new assessments and technologies and the effectiveness of various regulatory programs on Condensed Matter towards Condensed Matter Physics 2019 conducts presentations, share knowledge, meet with present potential and eminent scientists, and receive name recognition during this two days event. The heart of condensed matter physics is concerned with the properties of real materials in condensed phases like solids and liquids which emerge from the electromagnetic forces between atoms. By implementing the physical laws such as quantum mechanics, electromagnetism and statistical mechanics, the behavior of these condensed phases of materials is studied. The study of condensed matter physics includes measuring various properties of materials through experimental probes. Materials physics is the subdivision of condensed matter physics. It applies the condensed matter theory and describes the physical properties of materials. 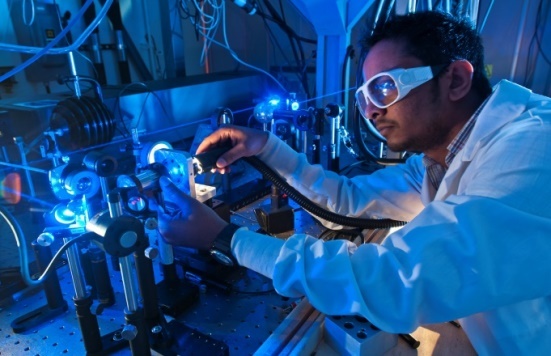 Novel insights of materials physics include electronic, optical, and magnetic materials, advanced materials and structures, quantum phenomena in materials, and soft condensed matter physics. Current experimental research results in improvised computational tools to understand how materials systems are modeled. The theoretical materials physics shares essential concepts and techniques with that of particle physics and nuclear physics. Condensed matter theory studies strongly correlated materials, where the strong interaction between electrons in the solid state gives rise to novel phenomena. Examples include the fractional quantum Hall effect and high temperature superconductivity. The methodology of these entire arenas includes analytic tools based on field theory methods, the development of computer algorithm, and the use of high performance computation. Experimental condensed matter and materials physics play an important role in understanding the properties of the materials at the atomic level. Most of the current major technological advances in consumer electronics are a direct outcome of fundamental condensed matter and materials physics research. Both the fields equally contribute to the advances in technological applications and for refining our fundamental understanding of the nature of matter and materials. Soft condensed matter or Soft matter is a subset of condensed matter. It comprises of various physical systems that are structurally altered or deformed when subjected to the thermal or mechanical of the magnitude of thermal fluctuations. The physical systems include liquids, colloids, polymers, foams, gels, granular materials, liquid crystals, and a number of biological materials which share a common predominant physical behavior at an energy scale comparable with room temperature thermal energy. The study of rigid matter, or solids, through methods such as quantum mechanics, crystallography, electromagnetism, and metallurgy is defined as Solid state physics. 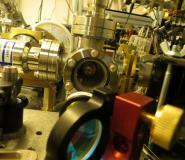 It is one of the largest sub divisions that emerged from condensed matter physics. It helps in analyzing the large-scale properties of solid materials that are result from their atomic-scale properties. Hence solid-state physics forms a theoretical basis of materials science. It also has explicit applications, for example in the technology of transistors and semiconductors. 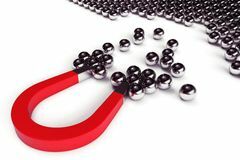 Magnetism is defined as a physical phenomenon that can attract or repel magnetic objects or materials. The attractive and repulsive magnetic forces between objects are caused by the motion of electric charges. Materials which display magnetic properties are called magnetic materials and they are classified in terms of their properties and uses. The two types of magnetic materials are soft magnetic material which can be easily magnetized and demagnetized and the other is permanent magnetic material which is difficult to demagnetize. Materials having an electrical conductivity value falling between that of a conductor, like copper, gold and an insulator, such as glass are called semiconductor materials. Their resistance is inversely proportional to their temperature which is opposite to that of a metal. By deliberate and controlled doping of impurities into crystal structures, the conducting properties of semiconductor materials can be altered. 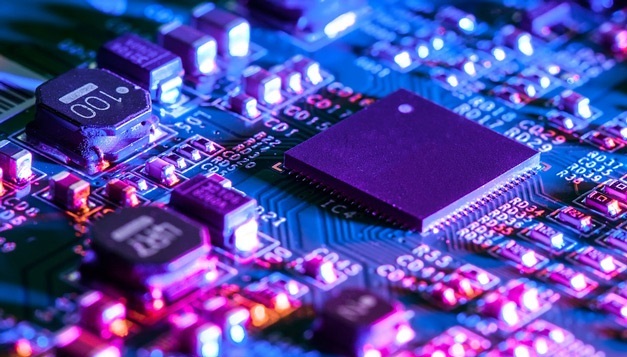 Semiconductor materials are vastly used for many purposes and some of the major applications include amplification, switching, and energy conversion. Materials possessing exactly zero electrical resistance and expulsion of magnetic flux fields when cooled below a characteristic critical temperature are called superconductors and the phenomenon is defined as superconductivity. 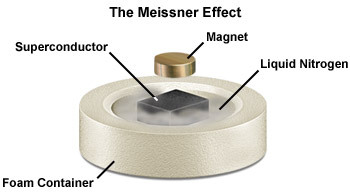 Superconductivity is a quantum mechanical phenomenon and is characterized by the Meissner effect, the complete ejection of magnetic field lines from the interior of the superconductor during its transitions into the superconducting state. An electric current passing through a superconducting wire can persist indefinitely without any power source. The design and discovery of new materials, solids in specific is defined as materials science and engineering. It is the combined study of chemistry, physics, and engineering for the better understanding of ancient, phenomenological observations in metallurgy and mineralogy. The advances in materials science are likely to affect the future of technology significantly. Current research in materials science focusses on nanomaterials, biomaterials, electronic, optical, and magnetic materials. Materials science also plays a crucial role in forensic engineering and failure analysis - investigating materials, products, structures or components which fail or do not function as intended, causing personal injury or damage to property. A semi-metal with minor overlap between the valence and the conduction bands is called graphene. 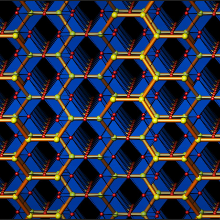 The detailed structure of graphene is described as an allotrope of carbon consisting of a single layer of carbon atoms arranged in a hexagonal lattice. The properties of graphene include electronic, optical, saturable absorption, nonlinear kerr effect and quantum dots. An allotrope of carbon in the form of a hollow sphere, ellipsoid, tube, and many other shapes is called fullerene. Spherical fullerenes or Buckminsterfullerene resemble the balls used in association football. Materials in which each unit is of 1 to 1000 nanometres (usually 1 to 100 nm) size in any one of its dimension are described as nanomaterials. Research in nanomaterials takes a materials science-based methodology to nanotechnology, influencing advances in materials metrology and synthesis which have been developed in support of micro fabrication research. 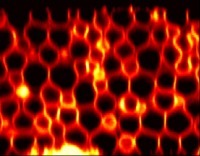 Nanoscaled materials possess unique optical, electronic, or mechanical properties. 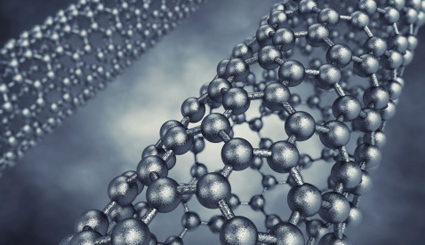 The application of scientific knowledge of nanomaterials to measure, create, pattern, manipulate, utilize or incorporate materials and components is defined as Nanotechnology. Quantum materials are those that have strong electronic correlations and some type of electronic order be it a superconducting, magnetic order or materials whose electronic properties are linked to non-generic quantum effects, like topological insulators, dirac electron systems such as graphene. The collective properties of such systems are governed by genuinely quantum behavior, such as ultra-cold atoms, cold excitons, and polaritons etc. The metals such as uranium, plutonium, and thorium, in any form are referred as nuclear materials. 14% of the world's electricity is been generated by nuclear power. The inter discipline advanced materials has been emerged from the fusion of chemistry, physics, nanotechnology, ceramics, metallurgy, and biomaterials. Advanced materials can be defined as all new materials that can be modified to existing materials to obtain superior performance in one or more characteristics that are critical for the application under consideration. 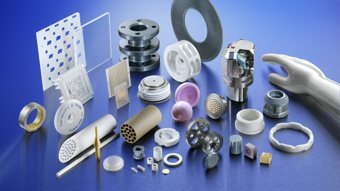 A ceramic refers to a non-metallic solid material comprising an inorganic compound of metal, non-metal or metalloid atoms primarily held in ionic and covalent bonds. Cutting-edge applications of advanced materials include carbon nanotubes, new types of X-ray tubes, new techniques of manufacturing Teflon and medical biopsies. Branch of biology that shares the methods of physics to the study of biological processes and structures is defined as bio-physics. Bio-physicists conduct research concerned with understanding the connections between the various systems of a cell, including the interactions between DNA, RNA and protein biosynthesis, as well as how these interactions are controlled. 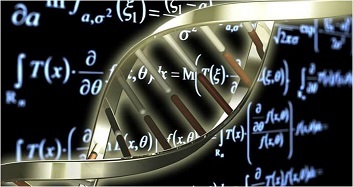 It is a multifaceted science using methods of, and theories from, physics to study biological systems. Biophysics reserves all scales of biological organization, from the molecular scale to entire organisms and ecosystems. 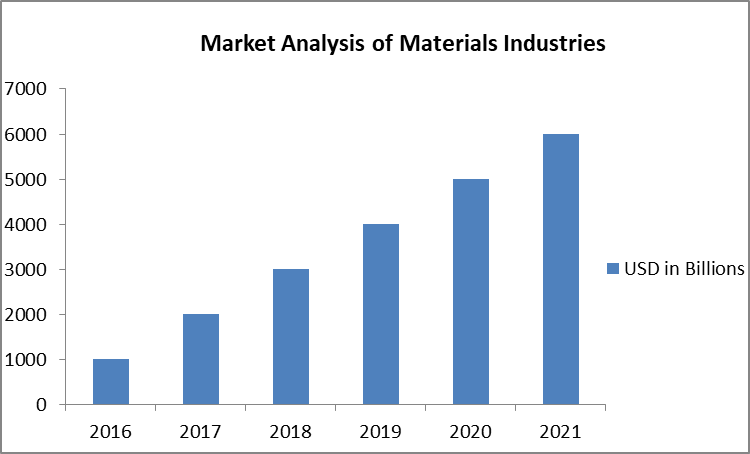 The global market for composite materials is expected to rise from USD 1.17 Billion in 2016 to USD 1.92 Billion by 2022, at a CAGR of 8.77% from 2017 to 2022. The usage of fundamental materials is becoming vital in wind energy, aerospace, marine, transportation, construction and other industries. The leading manufacturers of core materials are Hispano-Suiza (Spain), Evonik Industries AG (Germany), Armacell International S.A (Luxembourg), Plascore Incorporated (U.S.), Euro-Composites S.A (Luxembourg), Diab Group (Sweden), 3A Composites (Switzerland), Gurit Holding AG (Switzerland), Hexcel Corporation (U.S), and The Gill Corporation (U.S.). The market value for metamaterials is projected to be at USD 4,634.8 Million by 2025, at a CAGR of 63.1% from 2017 to 2025. The increasing concern for variety in design functionalities, anti-glare coating applications, and invisibility cloak for stealth aircraft are the important aspects to drive the growth of metamaterial market. The novel materials and technologies in electronics denotes the new or modification to the current materials and technologies to attain superior performance or efficiency. The market for the topmost advanced materials and technologies in electronics is observing high growth due to the rising end-use applications, technological advances, and the high demand of these technologies from both the industrialized and developing regions.